There is a lot of evidence showing that what we eat affects our health. It’s less well known that the long-term influence of our diet starts in infancy. Professor Wendy Oddy is a nutritional epidemiologist and investigates the impact of diet and nutrition, particularly during the first few years of a child’s life, on various diseases in the population. Professor Oddy draws upon data from the Western Australian Pregnancy Cohort Study, also known as the Raine Study. This study was established between 1989 and 1991 to determine how events during pregnancy and childhood influence health in later life. It involved nearly 3,000 pregnant women with regular follow-ups to track the health of the infants through childhood and into adulthood. Using Raine Study dietary data, Professor Oddy seeks to better understand the relationship between nutrition during the first few years of life and the development of chronic diseases including cardiovascular disease, type 2 diabetes, obesity, and mental health disorders including depression. The longitudinal dietary data collected in the Raine Study over many years makes it an ideal cohort in which to study the long-term impact of these factors. Other findings highlight the importance of a nutritious diet – rich in fruit, vegetables, fish, whole grains, and legumes – throughout the life-course. Research by Professor Oddy has demonstrated that a high intake of sweetened drinks is linked to risk factors for cardio-metabolic diseases in adolescents. Her work has also shown links between diets that are deficient in omega-3 fatty acids and the risk of mental illness and depression. Together with the findings of research from around the world and around Australia, Professor Oddy’s work contributes to the Australian Dietary Guidelines. These guidelines, in turn, are used by health professionals, policy makers, educators, and food manufacturers to help Australians eat more healthy diets. Professor Oddy is part of the Early Life Nutrition Coalition, which promotes the importance of nutrition before and during pregnancy and in the first few years of an infant’s life as a long-term preventative health measure. The Coalition publishes The First 1,000 Days, a publication given to expectant mothers. Professor Oddy is interested in further work on the nutrition of mothers both before and during pregnancy, as well as the nutrition of fathers. It has been shown that the nutrition of both parents is important not only for reproductive health but also for the later development of the child. For example, obesity of the father and the mother before pregnancy is a risk factor for a range of development problems for the baby. Using data from the well-established West Australian Pregnancy Cohort (Raine) Study, which has existed for more than 25 years, Professor Oddy is taking a strong multidisciplinary and collaborative approach regarding nutritional effects on infant, child and adolescent health. Since completion of her PhD she has had a clear rapid and continuing upward trajectory of research output. She achieved national recognition as one of the NHMRC ‘Ten of the Best’ in 2006 and an Achievement Award in 2010 for the top-ranked Career Development Fellowship (Level 2) in Population Health. Her work is consistently cited demonstrating leadership and influence and it receives consistent media exposure. Wendy Oddy is Professor of Nutritional Epidemiology. 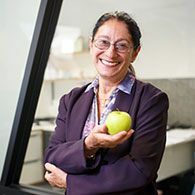 Prior to taking up this role in 2015 she was Principal Research Fellow at the Telethon Kids Institute in Perth, Western Australia for 20 years, leading the program of nutrition research on the WA Pregnancy Cohort (Raine) Study. Her project on breastfeeding and childhood asthma was named one of NHMRC Ten of the Best in 2006, and in 2010-2011 she was awarded an NHMRC Achievement Award for top ranked Career Development Fellow in Population Health. She is the recipient of competitive grants such as the Beyond Blue Heart Foundation Strategic Research Initiative, demonstrating leadership in her field. Prof Oddy has published >170 papers, chapters and commentaries: most as first or senior author. Her papers are cited consistently (with more than 5850 citations as of August 2018) and her work receives extensive media exposure. As a public health nutritionist recognised by the Nutrition Society of Australia, Prof Oddy highlights issues related to nutrition. She leads through publication, peer review, research translation and advocacy, editorials and commentaries, and contributes to the International Collaborative and Advisory Committee, Recommendations Development Panel of Early Nutrition (Germany), NHMRC Prevention and Community Health Committee, Research Translation Faculty and Healthy Start to a Healthy Life Steering Committee. She was Guest Editor for ‘Nutrients’ and in 2014 joined the Editorial Boards of Annals of Nutrition and Metabolism and Public Health Nutrition as Associate Editor. Prof Oddy’s work generates significant global attention related to population health nutrition. She provides intellectual leadership to nutrition research nationally and internationally as evidenced by her publications in the best quality, high impact journals, and consistent citations. She contributes to research training of postdoctoral scientists and students. Prof Oddy fosters an intellectual environment which supports and builds the capacity of postdoctoral research focusing on nutrition, clearly an issue of utmost importance to human physical and mental health. She is sought as a supervisor and mentor for postdoctoral scientists and postgraduate students and has a reputation for availability, wise guidance, encouragement and generosity in research and publication. She mentors research fellows who have independent research careers and are achieving outstanding positions. Prof Oddy currently supervises six postgraduate students. Prof Oddy joined the Scientific Advisory Board for the 2014 and 2016 Early Nutrition Conference in Munich and was the invited international representative on the Recommendations Development Panel and International Consultative Advisory Committee for Early Nutrition 2012 – 2017. Election to the International Advisory Council for the World Alliance of Breastfeeding Action (2011-19) and National Breastfeeding Campaign (2011-15) demonstrate her national and international standing. Prof Oddy has given 16 international plenary addresses, and numerous local talks, including the Nestle Nutrition International Symposium in 2017. Prof Oddy has given 16 international plenary and keynote addresses and more than 55 talks locally. She has more than 175 publications with >125 peer reviewed original research papers, 10 book chapters, 11 reviews and is first or senior author on 72% of these. She has had consistent success as CIA in obtaining major national and international grants and in 2009 was awarded a National Heart Foundation Beyond Blue Strategic Research Initiative, and in 2012 an NHMRC project grant. Her international recognition led to her involvement as CIA in the NHMRC-European Union collaborative project ‘Early Nutrition’ (2012-2016), a 36 institution project based at University of Munich, Germany. Building on her successful program of research in the Public Health and Primary Care theme at Menzies Institute for Medical Research, Prof Oddy is investigating the nutritional determinants of cardio-metabolic and mental health risk. She is producing results of significant importance and transformative to the Australian and International health and medical research communities. Her research is looking at nutritional pathways to disease, and improving the health and well-being of children through advocacy and provision of evidence. Her Early Nutrition work is showing the importance of nutrition before, during and after pregnancy and across the life-course. ‘Long term impact of early nutrition on metabolic health’ ID #1037966 2012-2016) led by the University of Munich. ‘Early Nutrition’ includes 16 institutions across Europe and the world with track records in nutrition and health. Prof Oddy collaborates with colleagues at Erasmus University Netherlands, University of Southampton, Kings College London UK, and Harvard University USA. These partners hold substantial and influential roles in learned societies relating to nutritional programming. Prof Oddy met with researchers biannually in Europe over the 5 years of the project for attendance at meetings and workshops, fulfilment of work package commitments, data analysis and discussion. Her collaboration with researchers on the International Collaboration and Advisory Committee and Recommendations Development Panel of Early Nutrition expanded her involvement. Four papers are published from this collaboration to date with 3 papers in preparation and the work is ongoing. Prof Oddy achieved national recognition as one of NHMRC ‘Ten of the Best’ in 2006, an Excellence/ Achievement Award in 2010 for top ranked Career Development Fellowship (Level 2) in Population Health, a Telethon Kids Institute Leadership Award 2011- 2013 and she is featured in the NHMRC Research Highlights in 2014. In 2017 she was awarded a Ten of the Best publication award from Menzies Institute for Medical Research, for her recently published paper on dietary patterns, inflammation and depression. Considerable work is being undertaken using Raine Study dietary data, to better understand the relationships between dietary intake and the early development of chronic diseases, including cardiovascular disease, type 2 diabetes, obesity, bone disorders, and mental health disorders. Projects are also examining the social and environmental determinants of dietary intake to inform interventions for improving population dietary intakes. The longitudinal dietary data collected in the Raine Study makes it an ideal cohort to study these factors. Prof Oddy’s principal tool of research on the well-established WA Pregnancy Cohort (Raine) Study, is going into its 30th year. This study has contributed to a large body of nutrition research across the life-course. As a Principal Investigator of the nutrition data on the Raine Study, Prof Oddy collaborates with numerous research groups as well as researchers from around the world. Prof Oddy has published >175 papers, chapters and commentaries: most as first or senior author. Her papers are cited consistently (with more than 5850 citations as of August 2018) and her work receives extensive media exposure. Top 5 Publications since 2013. Oddy WH, Herbison CE, Jacoby P, Ambrosini GL, O’Sullivan TA, Ayonrinde OT, Olynyk JK, Black LJ, Beilin LJ, Mori TA, Hands BP, Adams LA. The Western dietary pattern is prospectively associated with non-alcoholic fatty liver disease in adolescence. American Journal of Gastroenterology 2013; 108: 778- 85. Published in the best gastroenterology journal, we showed for the first time that a Western dietary pattern is a risk for non-alcoholic fatty liver disease (63 citations as of Feb 20/2018). Nyaradi A, Foster, JK, Hickling, S, Li J, Ambrosini GL, Jacques A, Oddy WH. Prospective associations between dietary patterns and cognitive performance during adolescence. Journal of Child Psychology and Psychiatry. 2014; 55 (9): 1017-24. Awarded the prestigious University of Western Australia (UWA) Graduate Research Best Publication Prize in the Clinical Medicine and Dentistry category 2014, as well as the Faculty of Medicine Prize for Excellence in Publication. Ambrosini GL, Oddy WH, Huang RC, Mori TA, Beilin LJ, Jebb SA. Prospective associations between sugar-sweetened beverage intakes and cardio-metabolic risk factors in adolescents. American Journal of Clinical Nutrition 2013; 98(2): 327-334. Published in one of the best nutrition journals, received extensive media coverage including an article in The New York Times in June 2013. The paper demonstrates an outstanding collaboration between Cambridge, Oxford and Perth, WA. Rzehak P, Oddy WH, Mearin ML, Grote V, Mori T, Szajewska H, Shamir R, Koletzko S, Weber M, Beilin LJ, Huang RC, Koletzko B. Infant feeding and growth trajectory patterns in childhood and body composition in young adulthood. American Journal of Clinical Nutrition 2017;106 (2): 568-580. This publication is the result of five years of involvement in the Early Nutrition project, for the first time looking at early risk factors for growth trajectories from birth to 20 y attracting global media attention. Oddy WH, Allen KL, Trapp GSA, Ambrosini GL, Black LJ, Huang RC, Rzehak P, Runions KC, Pan F, Beilin LJ, Mori TA. Dietary patterns, body mass index and inflammation: pathways to depression and mental health problems in adolescents. Brain Behavior and Immunity 2018; 69; 428-439. This manuscript is the culmination of work commencing in 2009, for the first time looking at biological pathways to depression, through dietary patterns, adiposity and inflammation, attracting extensive global media attention. Prof Oddy was CIA on a €12M European Union EU-NHMRC collaborative project grant (2012-2017), is CI on two other NHMRC project grants, a Telethon Research Fund grant and a WA Health grant (value >$5 million) and held an NHMRC project grant (2012-2014). She was the recipient of a competitive National Heart Foundation/Beyond Blue - Cardiovascular Disease and Depression Strategic Research Program Initiative grant ($435,375 2009-2012) and grants from Telstra, Rotary and Healthway since 2003. Tasmania does not currently have accredited laboratory facilities to determine iodine concentration of biological samples collected in Tasmanian research studies and monitoring projects.Sending samples interstate or overseas is becoming prohibitively expensive.This collaboration will facilitate establishment of cost-effective laboratory capacity in Tasmania.The proposed project will test and validate three types of assays for determination of iodine concentration in a range of biological samples routinely collected in Tasmanian research projects. Using data from a large cohort of Australian children followed for over 30 years, this study will investigate how weight status and physical fitness from childhood to adulthood determine early markers of cardiovascular disease and type 2 diabetes (cardiometabolic disease) in midlife. It will provide much needed evidence to address the high prevalence of cardiometabolic disease risk factors in young Australians through better targeted disease prevention and early clinical intervention strategies. Increasing evidence from European and other investigators around the world demonstrates that early nutrition has long-lasting programming effects for later health and disease risk. The most convincing evidence is for obesity and its associated disorders, that include metabolic syndrome, diabetes, cardiovascular disease, asthma and certain cancers. The focus of this project is on the increasing public health importance and intergenerational nature of these problems. Prof Oddy is a supervisor and mentor for post-graduate students, and has a reputation for availability, guidance, encouragement and generosity in research and publication. She supervises Masters and PhD candidates, successfully supervising six completing postgraduate qualifications. Currently she supervises six PhD candidates and mentors post-doctoral fellows embarking on independent research careers. She is Graduate Research Coordinator at Menzies where she mentors 105 Higher Degree by Research students.